Christmas is getting closer and bunches of mistletoe again adorn doorways. The tradition of kissing under the mistletoe is one that originated with the Druids. A white berry-like fruit is removed after each kiss. When all are gone kissing is no longer allowed. One legend states that a couple who kisses underneath mistletoe will have good luck, but a couple that doesn’t will have bad luck. Kissing under the mistletoe supposedly ensures a long marriage and fulfilling life. Legend also states that an unmarried woman not kissed under the mistletoe will remain single for another year. Kissing under the mistletoe is fine, but eating any part of the plant, especially the fruit is not. In general, avoid any plant with white berries. Poison ivy, oak, and sumac are prime examples. Mistletoe fruits technically are not berries. They are drupes, like cherries or peaches, since they contain only one seed. That doesn’t change their toxicity. They contain a poison called phoratoxin, which can cause blurred vision, nausea, abdominal pain, diarrhea, hypotension, and even death. Some people hear that mistletoe lowers blood pressure and they think that they can self-medicate themselves with just a few fruits. It’s not that simple. Don’t let the lower blood pressure symptom convince you to try some. Studies vary and some people show no toxicity symptoms other than an upset stomach, but it’s crazy to eat things well documented to be toxic in moderate or lower levels. Keep it away from children, since all plant parts are toxic. Several commercial extracts contain mistletoe. I strongly suggest consulting your doctor before using them. They could interfere with medication. Cancer and arthritis research on mistletoe is ongoing. Much of this has been in Europe and with the European mistletoe. American types have not been studied as extensively. Mistletoe is a unique parasitic plant. It’s what we call a hemi parasite, because it produces much of its own food through photosynthesis. It also taps the tree for all its mineral nutrition, and large infestations can severely weaken a tree. 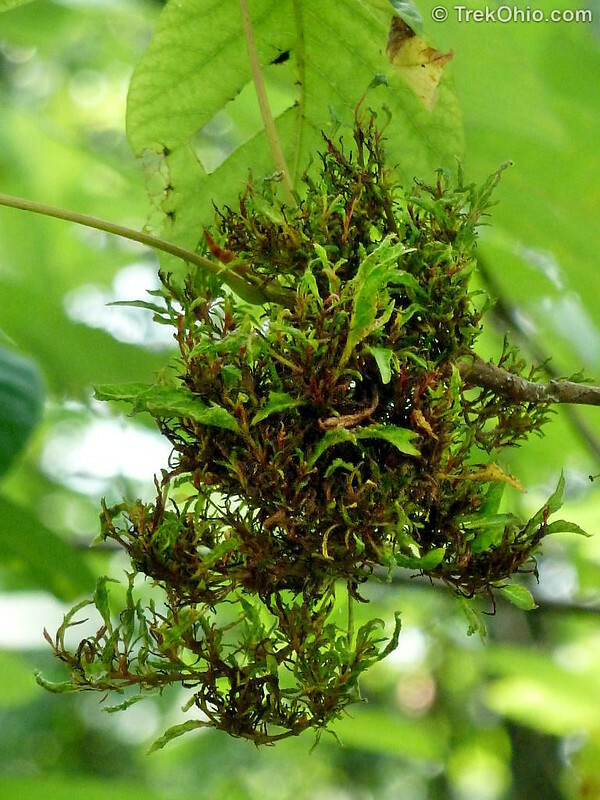 Successful parasites do not kill their hosts, and mistletoe alone rarely kills trees. It does make them more susceptible to other problems. Eventually the tree will probably die prematurely. Observant folks might notice that not all mistletoe plants possess fruits. Entire plants are either male or female. They form on trees when a single seed is deposited on a branch. Usually this is accomplished through bird droppings. The name mistletoe comes from two Anglo-Saxon words which translate to ‘dung twig.’ In earlier days people thought it was the birds themselves and not the seeds they dropped that caused mistletoe. These sticky seeds send out roots that penetrate bark and then wood of the tree. Over time they weaken the branch and often limbs break. Mistletoe can be pretty, especially in winter, but I suggest removing plants from your trees if possible. The best time to notice you have a problem is when the leaves fall, so pull it off your trees and stick it above your door. This entry was posted in foraging and tagged drupe, dung twig, hemi parasite, hypotension, mistletoe, nature, phoratoxin, white fruit. Bookmark the permalink. I photographed what I thought was a parasitic plant growing in a tree, and I thought that maybe it was mistletoe. But after looking at your photos, I’m growing more doubtful about that. If not too inconvenient, would you perhaps take a look at it? I think what you have is dwarf mistletoe. My sample was leafy mistletoe. Both are parasites, but leafy mistletoe is more common further north and on coniferous species. I meant dwarf mistletoe is more common further north and on coniferous species. Sorry. That might also be a witches broom, which is a fungus that has symptoms commonly caused by viruses. They must have 2 separate hosts to complete their life-cycle. without seeing it firsthand I’m not totally sure. The more I look at it the more it looks like a witches broom, because it does appear to have broad leaves trying to develop, like the blueberry witches broom does. Thank you for taking the time to help me identify this unusual growth. I had no idea that witches broom could be leafy. I have seen witches broom on numerous occasions on hackberry trees, and it’s all twigs with no leaves. After doing more reading on witches broom, I came across one article that said it can sometimes be caused by a genetic mutation, too. Maybe that happened in the tree that I photographed. I think it’s so pretty and why does it grow in your trees ? I knew they grew on trees, but they are very pretty and i try to bring them around every year. I just never knew mistletoe could be that poisonous and could harm trees. I love the look of these! I didnt know that they were poisonous. I also havent heard of the legends dealing with these. I never knew that it was that posiounous, ive heard you say that is all around the campus at school. I loved reading about the customs and traditions of mistletoe, and it’s good to know that the drupes are white and not the widely-believed red. I would have never thought that they are poisonous. They grow on trees around Christmas time. Their drupes are white but not widely believed to be red. The name mistletoe comes from two Anglo Saxon words which translate to “dung twig.” I never knew that mistletoe was a drupe and was not actually a berry. I also found out that they are poisonous. It can cause symptoms such as hypotension, blurred vision, nausea, and even death. This plant produces much of its food through photosynthesis. I love this plant because it makes pretty decorations in the winter time. I never knew that mistletoe was poisonous but I love to look at it during Christmas time. My family always hangs some up every year during the holiday!